It’s September, which means it’s officially time for the Autumn aesthetic to blow across our Insta feeds with the harbinger of spooky season, the pumpkin spice latte. 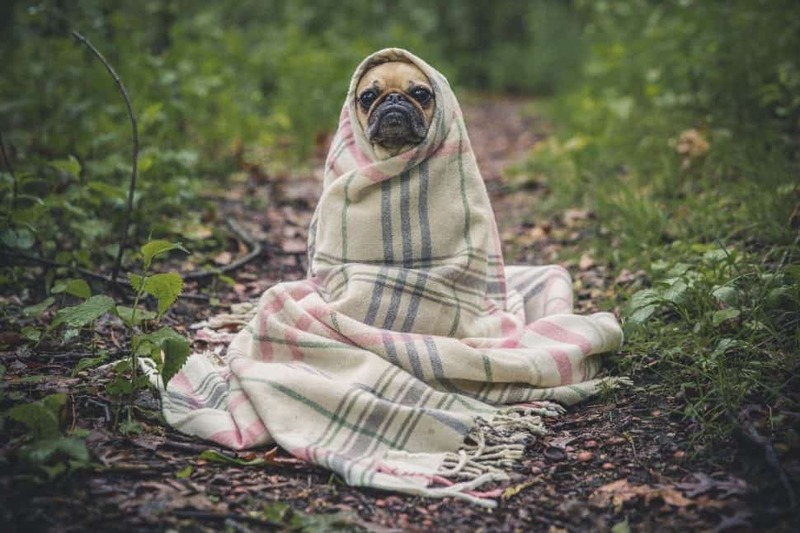 Back in the day, liking Autumn meant you liked chilly walks with the dog and orange foliage. Now, it’s almost a punchline as we gather on Instagram to share our bobble hat selfies and coffee cups. Starbucks’ audience seems to fall into two categories, coffee consumers who mock the PSL, and those who blissfully ignore the social shame that often comes with loving the beverage. In the 15 years since its creation, over 350million cups of the caffeinated pumpkin potion have been sold to the masses, and it’s hard to imagine a drink as ubiquitous as the pumpkin spice latte. While the long-awaited winter drinks get their fair share of fame, with bespoke red cups taking over social media feeds come mid-November, the pumpkin spice latte is its own beast. Unlike the festive favourites, the PSL looks no different to any other drink in a white paper cup. A Starbucks cup is just a Starbucks cup, but in this case it’s what’s inside that counts. By now, everyone knows how to take a photo of it. Hold your cup with dark nails, throw in a couple of leaves, boots and some pumpkins and you have yourself an Insta post worthy of a double tap. 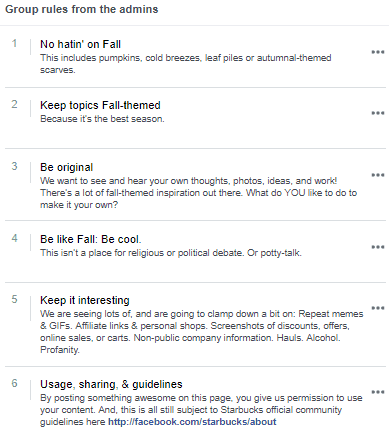 The autumn reign of terror, as some see it, begins in late August as seasonal creep gets in full swing, when the PSL transcends from seemingly innocuous drink into a social media icon. Over the last few years, the coffee company has turned the drink into a marketing machine. 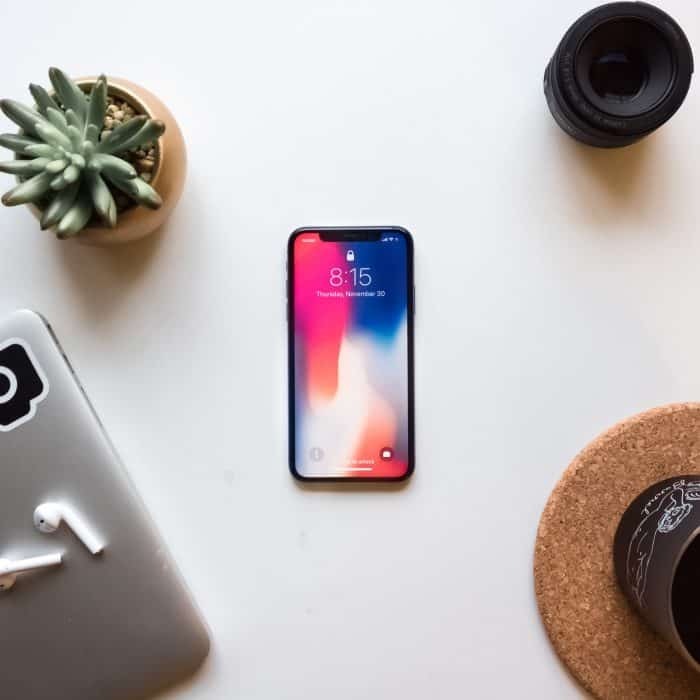 It didn’t happen overnight and while it’s certainly benefitted from keeping a firm strategy in place, its relied heavily on the loyalty of its customer to produce visual content. Luckily, millennials form a large part of the PSL audience and have the instinctual habit of sharing everything. They grew up when social media was invented, growing with it and sharing as they went along. Millennials, along with Gen X, feel the urgency of social media and many of them are happy to show that they’re first in line for the limited-edition drink. 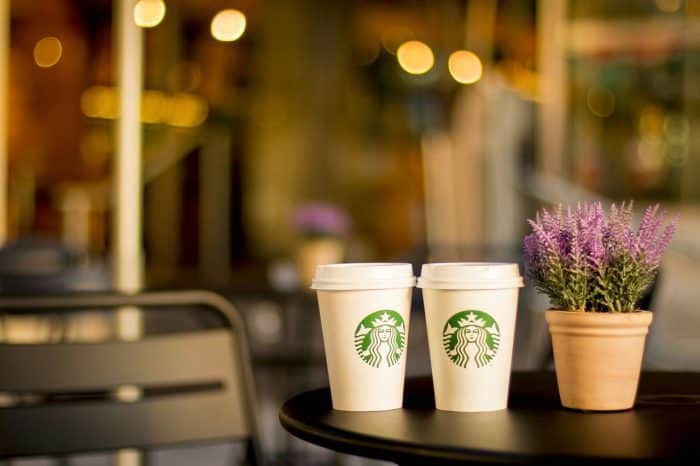 With the explosion of user generated content over the last decade, Starbucks eagerly tapped into its consumers’ love for cosy nostalgia and snapping its signature cups. 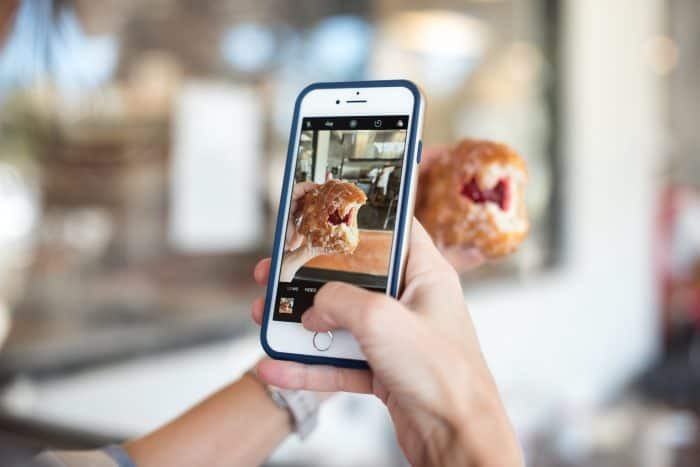 For its target demographic, a shameless Insta is part of the fun – and Starbucks knows it, this is all part of the experience that it sells. In 2016, social media analytics company Spredfast measured the pumpkin spice hype, finding that Starbucks’ famous autumn coffee receives 493 percent more likes per post than photos tagged with #Starbucks. That year, it also launched a Facebook messenger bot for the drink where fans could talk to The Real PSL directly. Of course, it was fun and interactive and as all bots are, limited in its response but amusing nonetheless. The peak of its social media popularity came down to two things, its reliance on its audience to create demand, and social media accounts created specifically for the drink. 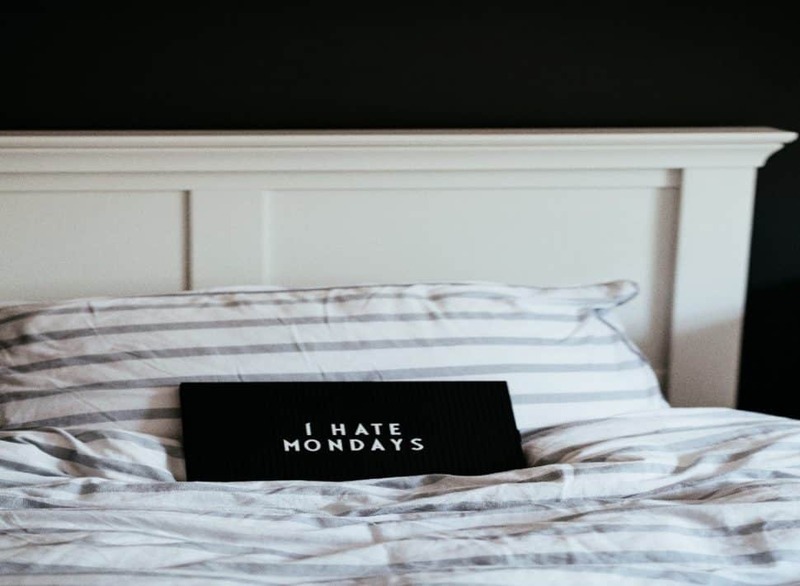 It built Instagram and Twitter accounts that lay dormant for much of the year, with an online presence that only emerges during the winddown of Frappuccino season. With 36.8k and 110k followers on Instagram and Twitter, TheRealPSL is always in character. With pumpkin puns and personal replies to Tweets, the account has provided the digital version of a name scrawled on a paper cup, without the misspelling. The verified accounts are reactive to social media buzzwords, tapping into trends that saturate timelines. 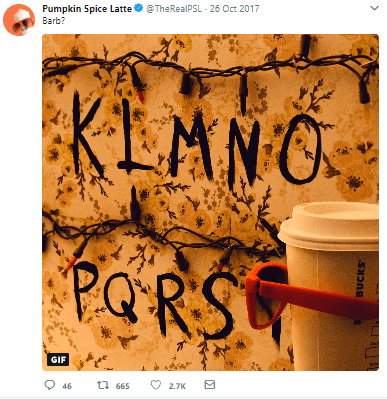 In 2017, it hooked into the popularity of Netflix success Stranger Things, using the show’s recognisable fairy light wall to spell out PSL in a one-off Tweet and Instagram animation which amassed over 15000 likes collectively. 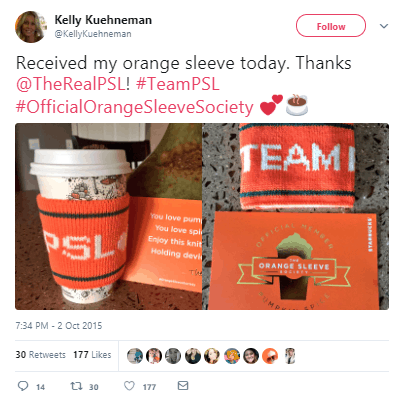 A few years ago, it also targeted pumpkin spice fans by inviting them to join the Orange Sleeve Society, a not-so-secret society where members received knitted orange cup sleeves to adorn their Starbucks cups. The drink might be considered ‘basic’, but Starbucks knows how to sell it to those who love it. 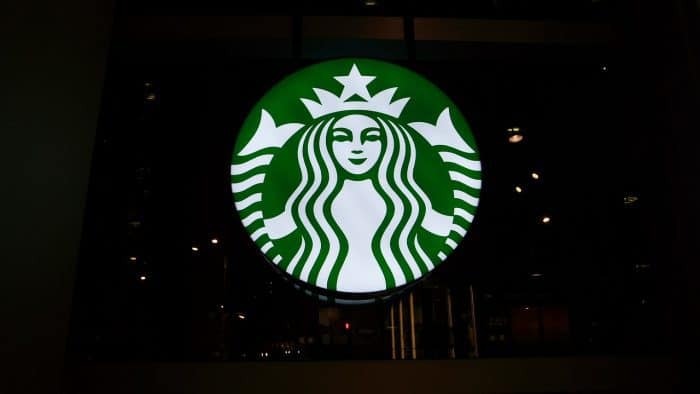 In the UK, the coffee giant quietly dropped the PSL and its counterpart, the newly crafted Maple Latte, a week before the official launch for it’s My Starbucks Rewards customers. With minimal fuss and an app notification that let pumpkin spice lovers in on the secret before anyone else, it created demand through the social endorsement that millennials value above all else – social endorsement from their friends and followers. 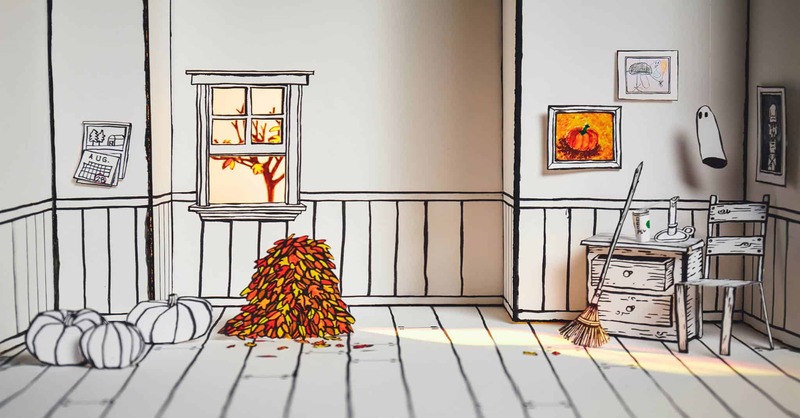 While it seemed quiet on the social media front, 2018’s social strategy included creating an exclusive Facebook group known as The Leaf Rakers Society. The group is a place for PSL fans to come together and celebrate the upcoming season, while the company gleans insight and feedback from its customers. Despite only promoting the group once across its channels, it accumulated over 23,000 members in under two months. 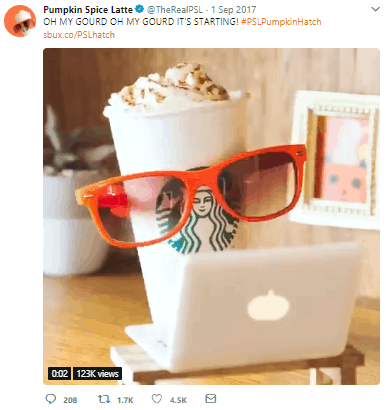 While it enjoys a social media explosion of coffee cup selfies and leaf emojis, Starbucks is no amateur and it knows that the PSL is one of the most popular and controversial social media conversation starters. It happily pokes fun at its ‘basic’ stereotype, with many of its fans following suit. The PSL might taste a bit like a candle and if you hate it, you’ll probably brag about hating it, but that’s all part of the charm. The point is you bought one anyway, and you’re talking about it. People across Cardiff and the Vale of Glamorgan are being urged to swap their car for the bus to celebrate the 6th annual Catch the Bus Week. The bus operator is taking part in the UK-wide initiative, which aims to promote the ease, comfort and environmental benefits of choosing sustainable bus travel. 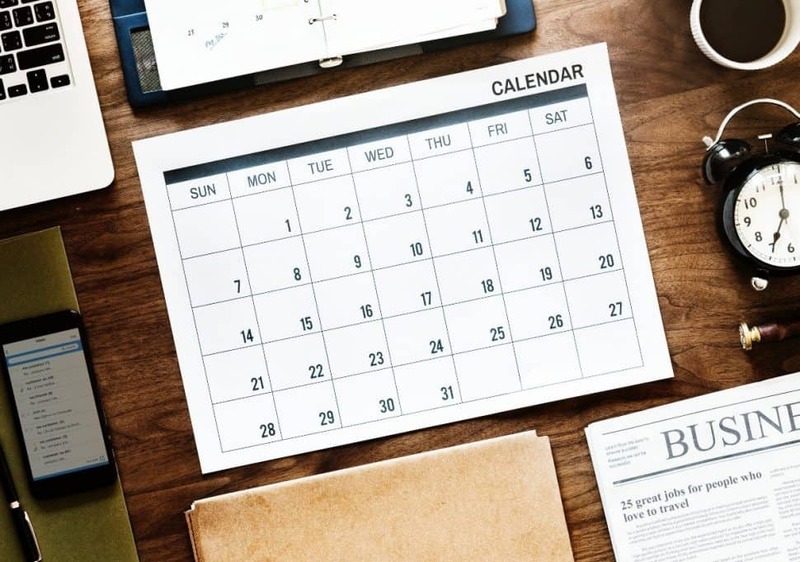 The week, which runs from July 2nd to July 8th, will see operators across the country hosting public information sessions and events to help promote bus travel to non-bus users. During the initiative Cardiff Bus will be taking part in the Your Bus Matters event, at Barry King Square, on Tuesday 3rd July from 10am to 2pm.The event, hosted by Bus Users Cymru, provides the chance to discuss timetables and services. Then on Wednesday 4th July from 10am to 4pm the bus operator will be hosting a Cardiff Bus Roadshow, on Queen Street, to enable people to learn about the benefits of bus travel and receive a free goodie bag. Commercial manager at Cardiff Bus Gareth Stevens said the initiative was a “fantastic way” to highlight the various benefits of bus travel. He said: “We at Cardiff Bus are pleased to be supporting the 6th annual Catch the Bus Week. “This event is vital in highlighting the numerous benefits of bus travel, so we would encourage people to come along and find out more. “We look forward to getting out and speaking with our valued customers and getting feedback on our services. The bus operator will also be giving away daily prizes via its Twitter and Facebook channels, including weekly and monthly bus tickets.